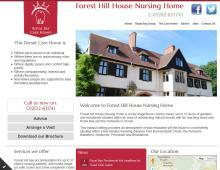 Forest Hill House Nursing Home is a residential nursing home in Poole based in a country manor private residence. The elderly care home in Poole is set within fifteen acres of woods and gardens providing the residents with a peaceful setting and lovely outlook. The local areas of Poole, Bournemouth, Wimborne and The Purbecks are all easily accessible for this rest home in Dorset. This gold standard nursing home in Dorset can accommodate up to 37 guests in mostly single rooms, all of which are ensuite. Forest Hill House nursing home in Wimborne has social areas for its guests including lounges and dining areas. Facilities in the residential nursing homes in Dorset include chiropody, physiotherapy and hairdresser services . Forest Hill House nursing home can often provide respite care in Wimborne for an elderly relative. This can help full time carers to have a holiday or assist an elderly person to convalesce after being in hospital. This care home in Wimborne can arrange long or short term nursing stays and tours can be arranged for prospective guests. This beautiful rest home in Dorset is one of just a few gsf accredited care homes in Dorset and offers 24 hour care from trained staff and carers. All Royal Bay nursing homes in Dorset have their own chef who provides home cooked foods and is happy to meet individual dietary requirements. Care home jobs in Dorset such as registered nurse jobs in Poole, nursing home jobs in Wimborne and care home manager jobs in Dorset are advertised as and when vacancies arise. Requirements and qualifications needed are included in the job descriptions. Forest Hill House is one of the Royal Bay Group's Dorset care homes, all of which have an outstanding reputation for standards of care.